The little boy's name is David LeFevre. LeFevre had the opportunity to travel to France to learn from some of the best Michelin-starred chefs. From there, he returned to the United States and whilst in Los Angeles, became the Executive Chef of Water Grill in Downtown Los Angeles. The Water Grill was where he became a reputable chef, earning his first Michelin star. And it was then that he decided to start his solo career at Manhattan Beach Post. Manhattan Beach Post (also known as MB Post) is a rustic, open, and captivating restaurant set in beautiful Manhattan Beach. It is a social house where people gather and socialize over delicious food prepared from Chef LeFevre. Plates are meant to be shared and through each delectable bite, you can taste the effort and love Chef LeFevre put into the dishes. ILLY COFFEE ($4.50): Regular or decaf. Good coffee. Unfortunately, the waiter was not attentive with refilling my coffee or providing enough sugar/cream. MY FAVORITE DISH. BACON CHEDDAR BUTTERMILK BISCUITS ($6.00): Maple Butter. This is by far one of the best biscuits I've ever had. The crisp exterior was perfect to the moist, crumbly soft interior. It was savory in all aspects and the maple butter was the ideal complement. I think I could eat a dozen by myself, but unfortunately, an order comes with only two. FRENCH TOAST ($12.00): Stuffed with in house ricotta, Ha's bartlett pears, candied almonds. Brunch is a sweet thing to do and it is only necessary to order a sweet dish in honor of brunch. The toast was crisp, the ricotta added a nice texture and the pears were cooked perfectly. My only complaint was that it was such a small dish (but that's cause I'm a piglet). BENEDICT ($15.00): Bacon cheddar biscuit, arugula, la quercia tamworth proscuitto, hollandaise. So delicious. This is how a twist on eggs benedict should be. I appreciated the biscuit at the bottom and the salty proscuitto. The hollandaise was creamy. Everything meshed well together and as a result, this was a successful dish. TRUFFLE HONEY LACED FRIED CHICKEN ($15.00): Kohlrabi slaw. Imagine the most delectable chicken coated in a perfect batter and deep fried to a supreme crispiness. The chicken was juicy and moist. The honey added a nice sweetness. Everything about this dish was immaculate and was by far one of my favorite dishes. A must order! THAI PORK SAUSAGE ($6.00): Papaya salad, lime. The presentation of the pork sausage just reminded me of a hamburger patty on a bed of vegetables. But, little did I know that this sausage would be so different than any other sausages I would eat. The first bite was moist and savory. Towards the end of the bite, I received a nice kick from the Thai spices and chili. Thank goodness for the papaya salad to cool off my palate. If you like spicy food, then this is a good contender. HOUSEMADE PORK AND SHRIMP DUMPLINGS ($12.00): Citrus Ponzu, Chicharrones, Chili oil. These delicate pillows of pork and shrimp were flavorful The ponzu sauce added a nice acidity while the chicharrones added some crunch to the dish. The chili oil balanced out the dish by adding some heat. Although this was not one of my favorite dishes, it was by no means awful. It was just out-competed by so many other flavorful and wonderful dishes. Overall, Manhattan Beach Post is a fantastic restaurant that lives up to the name: A Social House. The drinks are great and the food is fantastic. This is considerably one of my favorite restaurants in the South Bay, let alone, in Los Angeles. Whether you choose weekend brunch or weeknight dinner at MB Post, you can't go wrong with any of the dishes. On a side note: parking can be quite difficult. If you're lucky, you may be able to find street parking or valet if you come during dinner hours. 272 S. La Cienega Blvd. The farm to table concept has been a recent trend that is overtaking many restaurants locally and abroad. One such restaurant, Prospect Gourmand has incorporated this concept with open arms. This small and quaint Beverly Hills restaurant is new, cozy and brings fresh elements from the farmer's market to your table. Approximately 60% of the ingredients are organic. Chef Isaac Gamboa and his staff visit the farmer's market once a week in search for the freshest ingredients that are in season. As a result, his dishes are innovative and enticing. 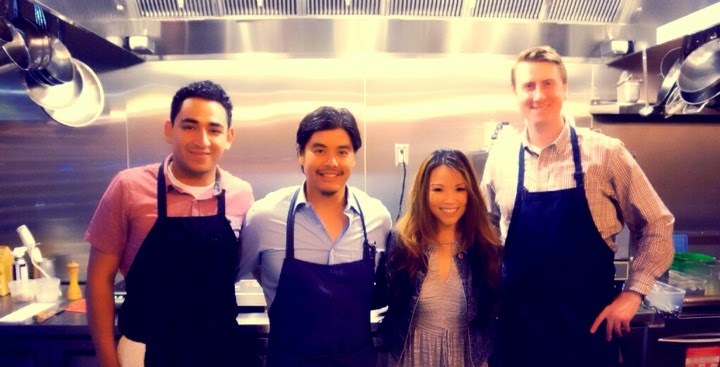 Using French techniques, Chef Gamboa creates dishes with a modern twist. Take for instance the Prospect BKE Burger: a delicious burger topped with kimchi! Kimchi?!?! Yes, who would have thought a ground beef patty could taste so good with kimchi. Or the Gourmand Burger with the option of adding foie gras. With the food on the verge of being top notch, there are still a few kinks to work out like any other restaurant that has recently opened its doors. POUTINE ($12.00): Gourmand fries, topped with pork belly, dashi gravy, homemade citrus ricotta. This dish is a twist on the traditional poutine which uses cheese curds instead of ricotta. Although the homemade ricotta melted from the heat of the fries, the flavors were good overall. A few of the fries were soggy, which was expected since it was doused in gravy. PROSPECT BKE BURGER ($19.00): Bacon, Kimchi, Organic egg, french fries. This is a good dish. The burger is juicy and moist. The kimchi adds a nice acidic and aromatic feel to the dish. It's a burger with a twist and worth a try. I'm not a fan of the thick cut fries so that's my only downfall to the dish. It is a personal preference. FREE TO ROAM CHICKEN ($19.00): Crispy pan fried, easy peasy mac and cheesy, heirloom carrots. This chicken takes approximately 20 minutes to make. It is moist and full of flavor. The crispy skin adds a nice touch. Utilizing mac and cheese instead of the usual mashed potatoes is a nice change. Sugar snap peas and onion au jus are present to finish off the dish. CHOCOLATE TURTLE SHELL TARTE ($9.00): Chocolate tarte, salted caramel ice cream. If you want a decadent dessert and just straight chocolate, then this one is for you. It is rich and definitely heavy. The gelato is supplied from a local gelato shop in Redondo Beach, CA. I could not finish this dessert even though I am a dessert fanatic. Overall, Prospect Gourmand has the potential to be something amazing. It is a fairly new restaurant that still needs some minor improvements. For example, my utensils were forgotten when I ordered my food. Additionally, it took some time to flag down a waitress to order dessert and for the check. In terms of the food, it is aromatic and pretty flavorful. I'm sure with a few tweaks and some time, this restaurant will be one of the popular restaurants in Los Angeles.